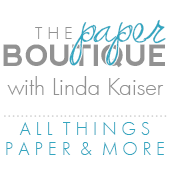 I am a guest designer today for My Craft Spot and I am so excited to share my project with you! I used the Tiny Tag Stamp set and matching metal dies to create this adorable mini tag. Please scroll down to see the wonderful My Craft Spot sets that I used. I made the rosette from an Anna Griffin kit I purchased two years ago, but any type of rosette will work. Click here to see my video on how to make rosettes the easy way! The trick is to use a jar lid. The ring box is a Silhouette cut (image # 29813) that I purchased from the Silhouette On-line store. I made the ring for a friend and just had to add the perfect tag! Love the stitching! These are the products from My Craft Spot that I used to make the adorable mini tag. There are two additional mini tag stamps sets that you can purchase to use with the metal dies. This is the most versatile tag set ever! A special thanks to Kimberly for sponsoring the following giveaway. To enter to win a stamp set from My Craft Spot (you get to choose the one you want) you need to be a follower or subscriber of my blog. You can sign up over on the right side of this blog (if you are not there already). And leave a comment under this post telling us what stamp set is your favorite, only one comment per person please. For additional chances to win, please help me spread the word about the giveaway. For each mention on your blog, Facebook post, or re-pin you receive an additional chance to win. Just leave an additional comment on this post that you did. You have until midnight MDT on Thursday January 23rd to enter and the winner will be announced on Friday January 24th. Be sure to check out My Craft Spot products, you will be happy you did! Your box, tag and ring are gorgeous Linda! I have had my eyes on her tag dies and the tag sentiments for a while now. I am already a follower of yours. How adorable! I love this little box! You decorated everything beautifully, Linda! 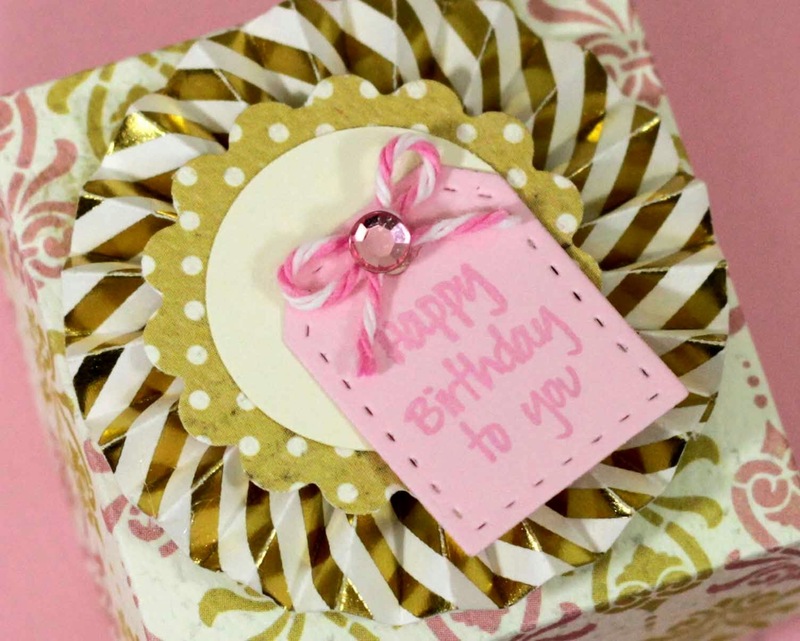 Your little box is just adorable and the tiny tags look so sweet on it! I love this project. I would love to win the tiny tags gift set. I love the little box. I like to make boxes. They are always unique and special. Great job! Beautiful box and tag. I follow through GFC. Love your little ring box! I'm so glad I saw this post, as I jumped back to view your video on making rosettes. What a great idea to use a jar lid ~ I always struggle with getting the rosette into a perfect circle and applying hot glue without losing the shape! I can't wait to give this technique a try! Thanks so much for the chance to win! My favorite stamp set is "Happily Every After" ~ I'd seen that one before and though how perfect it would be to use for favors for my son's wedding this fall! Great box, tag and ring. Thanks for always sharing new sites/blogs with us. I look forward to viewing your video on rosettes. I love the tiny tag set. It goes perfect with the beautiful box. The ring will be a nice present for your friend. I am a follower and love your blog. Thanks for a chance to win. I love the tiny tags stamp set, there are a lot of phrases on it that you can't find anywhere else. It made such a cute tag for the box; love the colors. Lovely! I love the tags and the sentiments! Thanks for the chance to win! 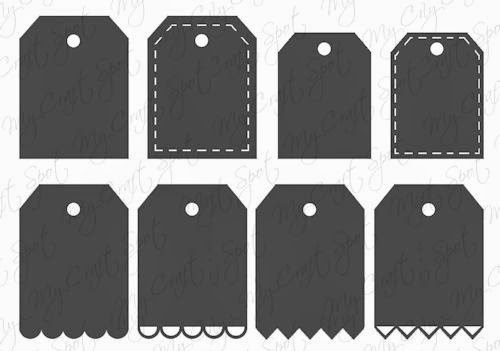 I love the tiny tags, but I've jsut been over to the site and really like the basic jar set. I've been wanting a set like that! They are ADORABLE!! love it!! Pretty box. Love the tiny tag. So many sets to pick from!! But I just love the Chalkboard Sentiments set right now. Thanks for a chance to win :) I am already a follower via email. Beautiful ring and ring box! The papers are gorgeous and love the little tag! I LOVe the Tiny Tag set, so versatile! This is a set I have been wanting for a long while. Super excited that I have a chance to win it. Thanks!! You did a great job with it on your pretty box. Lovely box! I love how you decorated IT. That tag is adorable! Thanks for the chance! Post on facebook about this awesome giveaway. Your project is just lovely, Linda! Congrats on this honor being a Guest Designer for Kimberly. My favorite of all her lovely stamp sets is the new Chalkboard set. LOVE IT! Your ring box is beautiful, Linda! I love your pretty rosette and cute tag! Thanks for being such an awesome guest designer at My Craft Spot! I love the small alphabet, the big sentiments and the with deepest sympathy stamp sets! Love your videos. Found you when I was looking for information on the ruler and perfect layers. Congrats on being asked to be a GD. I have never heard of this company before. I'll have to check out the site and become a follower. Love the tiny tags stamp and your box and ring is gorgeous. I just popped over and checked out their site. The stamps are wonderful. She uses such great fonts. Thanks for tipping us off to another stamp source. Love your box and tag. My favorite stamp sesst would be Birthday Wishes because I never seem to have the right stamp. Thanks for a chance to win. I am a follower of your blog and Pinterest. LOVE your sweet rosette. It is perfect to top off your pretty box. My fav My Craft Spot stamp set is the Tiny Tags one you used. It has been on my wishlist forever. Thanks Kimberly for sponsoring this give away. I love all your videos on rosettes. I like the tiny tag set #3. They are all great. My favorite stamp set from My Craft Spot is the Birthday Wishes. Like the sentiments and this is primarily the most type of card that I create. Thanks for the chance to win a stamp set. Your rosette and box are awesome. I like the jar sets, but I really like the little tiny tag set with all the little sayings. I really enjoyed the video with the tip about using a jar lid to help form the rosettes. I've been a follower for some time now and I really enjoy your blog. Beautiful projects! Thanks for the chance to win this cute tags set. I really love the Jingle All The Way stamp set, my absolute favorite would be the Christmas Friends & Neighbors stamp set except I would rather it for family and friends. It would be perfect to add to the little treats and gifts my husband and I give out each year. great project.. I'm a follower.. and my choice of stamps would be "feel better soon" love it. Love you idea for rosettes by using lids to help hold them together. Papers on box so beautiful, love you blog. I like the Stamping All Around Christmas stamp set. I love making boxes! I've made several with my Silhouette Cameo. I pinned to Pinterest & shared on FB page. My favorite stamp set is Pattern Blocks. Would love to plaly with that set. Thanks for the chance to win! Great video on rosettes Linda!! 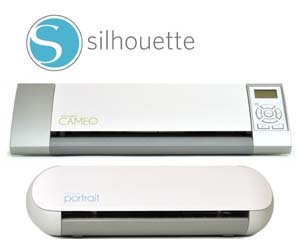 I'm going to the Silhouette store to purchase some designs right now! Have been following you for a while now and love your blog. Loved your little box. Thanks for the chance to win your stamp set. Love the tag dies. Thanks for a chance to win! My grandchildren would love getting cards with the "Cute Critters" puns on them. I liked seeing all the sentiments available. It's nice that some of them corrdinate with dies. Makes it easier. Those tiny tags are great. But I also love the chalkboard sentiments. What an adorable ring box, tag and ring. You are just so clever. Thank you for the chance to win your giveaway. I've been a follower for years. I've been a follower for years, but just this Saturday got a Silhouette Cameo for my Bday! I'm loving it and all the fantastic designs! I love the tiny tags, I have owned the stamp set for a couple years~use them all the time! Love your blog. Thanks for all your inspiration. Love your box - it is beautiful. I have been following your blog for quite awhile now and always find inspiration. Thank you for the chance to win. I love the tag stamps and die sets. T also love the Cute Critters stamp set. I love the tag sentiments!